Today it’s time for another DIY! How is it going by you so far?! Enjoying my crafts?! Anyway, since I love paper so much, I thought why not make some decoration. I chose to draw out Tinkerbell on a present, and devide her in little parts, so you get a 3D effect, kinda. Let’s just start the tutorial, so it get a bit more clear! ♥ Cardstock in the colors Green, Red, White, Yellow, Blue and Beige. 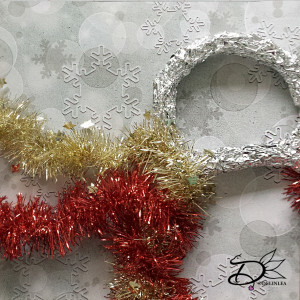 ♥ Things to decorate, like glitter, gelpen, etc. (optional). Start of with downloading these templates, you can either choose to print them out, or trace them from your screen. Then copy all the little parts from template 2 and 3 onto the cardstock, every part on the right color. The numbers show which part goes where so you can easily pick your colors for you creation. You can always choose to change colors if you want to ^-^. 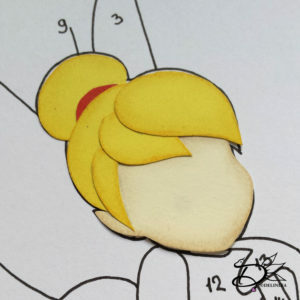 When you are done tracing all the parts, you can cut them out. 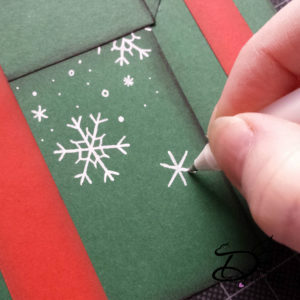 If you are ready with cutting all the parts out, you can choose to make the edges of the paper darker or lighter with some Soft Pastel (or you can use colored pencil, but that makes it a little harder). 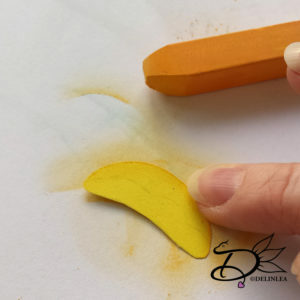 What I did is go along the edge with the pastel stick and rubbed it with my fingers. (but if you don’t like to get dirty fingers use a tissue or something like that). To do this you create a bit more depth in the end result. When all the parts are done, you can start gluing all the parts together. Use template 1 as a guidance. This way you almost can’t mess up. and when you are ready draw on her eyes, mouth and nose. Now it’s time for the fun part, decorating! This is totally optional to do, but I had so much. I drew little snowflakes on the present and use glitter glue for her wings and dress. It gives just that little extra. I hope you had fun making Tinkerbell! I know I had, cause I needed a small break from all the crocheting xD. Today it’s Piglet time! This adorable little piggie can’t be left out, right?! It’s one of the first I made and I really struggled somehow to get his face right. In the end I just quited struggling and left it the way it is haha. So, yeah, he looks a bit sad. Anyway let’s go on to the pattern. 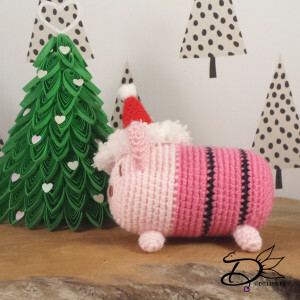 ♥ Yarn: in the colors Light pink, Pink, Hot Pink, Black and Red. ♥ Cloud Yarn in White. ♥ Embroidery needle with brown and pink thread or brown and pink felt. 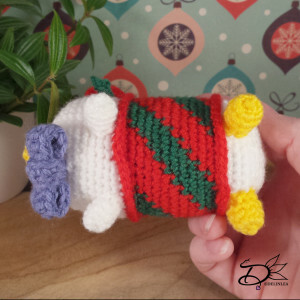 Change to white cloud yarn. Fasten off and weave in tail. Glue the pompom on the tip of the hat. To make sure you sew all parts in the right place, you can use some sewing pins to position them. When you are happy with the position, you can sew them on. Sew the legs on to the bottom of the body, the front legs are pointing to the front. The back legs are pointing to the side. Sew the ears on top of his head, just beside each other. and put his little Santa hat over one of his ears! For the eyes, eyebrows and nose, you can either choose to use felt or you can embroider them on. I chose to embroider them on, cause yeah why choose the easy way haha. But which way you choose, Piglet will look cute. I hope you enjoyed making Piglet, he loves his little Santa hat! Day 8 arrived! 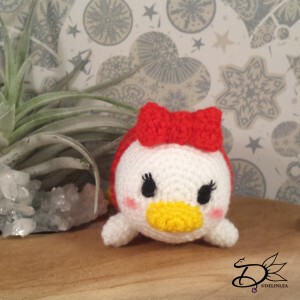 And it is time to make a Amigurumi Daisy Tsum Tsum! She’s so cute with her bow on her head, and her little Christmas sweater. Do you enjoy the DIYs so far?! I know I do. 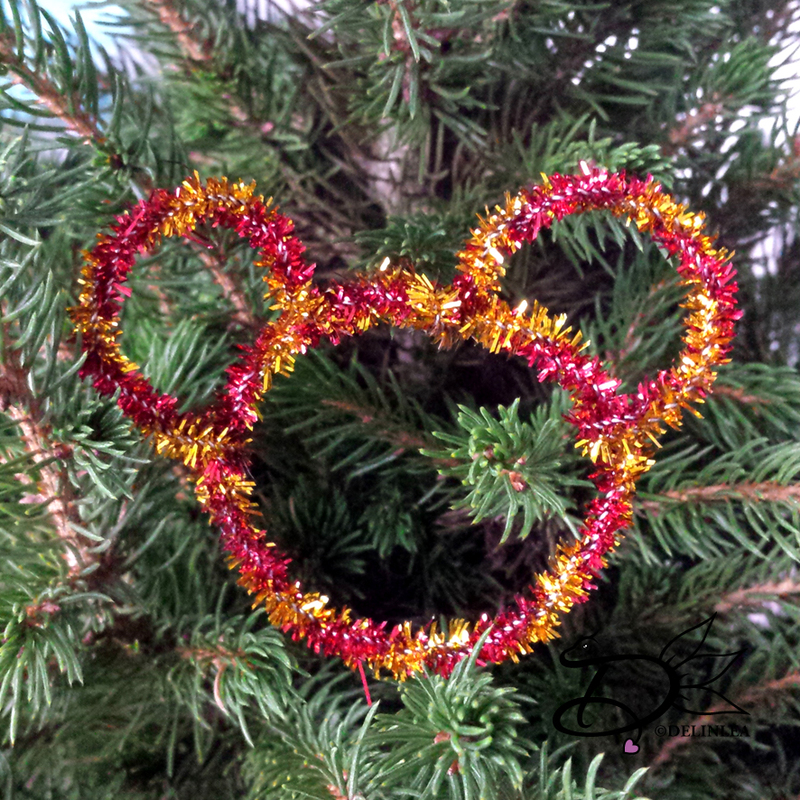 It’s fun to make a Disney themed Christmas this year. Usually I keep it traditional, tho with a lot of colors haha. How does your Christmas usually look?! ♥ Yarn: in the colors White, Red, Yellow and Green. Make 2 with white and 2 with yellow. Fasten Off, leave long tail for sewing. Fasten off and sew both ends toghether and weave in the end. Fasten off and sew both ends together and put it in the middle of the bow. (easiest is to sew it around the bow) leave the tail long so you can sew it to her head. Flatten her beak, and sew it just under the middle of the face. Sew her bow on top of her head. And add the dots randomly to her shirt. 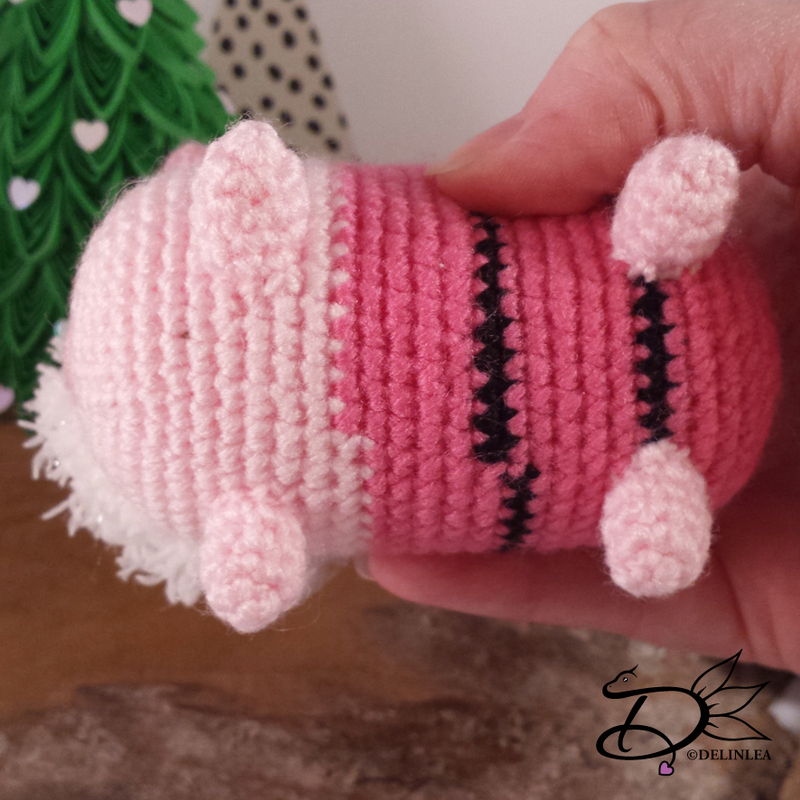 For the eyes and lashes you can either choose to use felt or you can embroider them on. I chose to embroider them on, cause yeah why choose the easy way haha. But which way you choose, Daisy will look cute. You can also add some pink soft pastel or blusher to give her nice pink cheeks. I hope your Daisy turned out cute as well, so she can join Donald. Enjoy the rest of your day! Day 7 already of our countdown to Christmas! 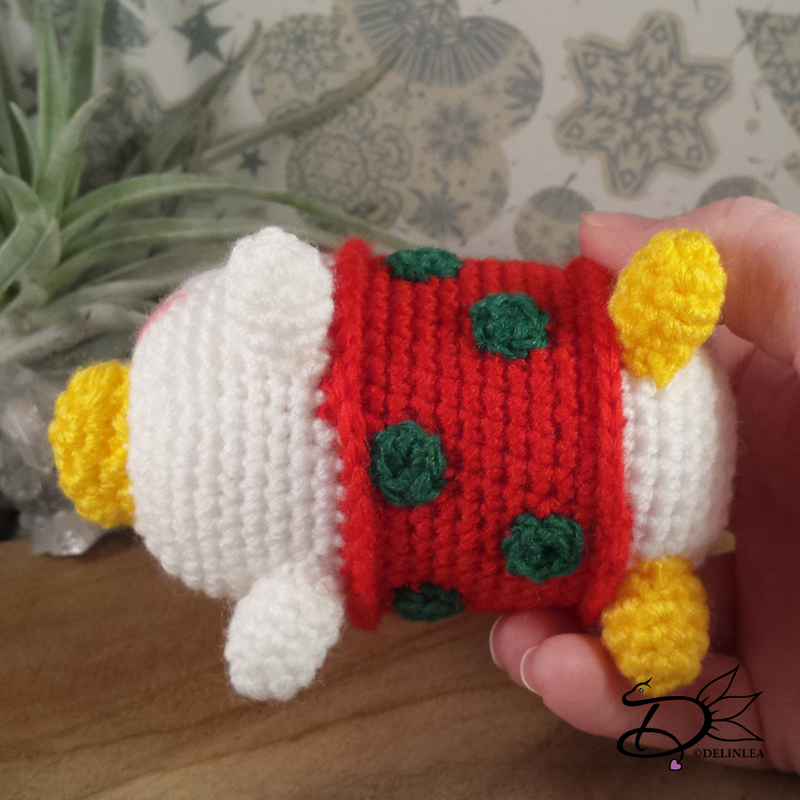 And today we will make a Donald Tsum Tsum Amigurumi! I always love how dorky he is, specially with his nephews. I wonder why I never watch videos of him anymore..hmm I probably should look up some again. Let’s give him some love, right?! 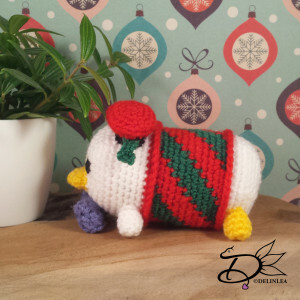 ♥ Yarn: in the colors White, Red, Yellow, Pruple and Green. 7: 12SC in each st around. Fasten off and leave long tail for sewing. You can choose to slightly stuff his hat. Chain 3, make 2 picots (if you are not sure what a picot st is, check online), 3SC. Fasten off and sew it to his hat where the red and black meet. Flatten his beak, and sew it just under the middle of the face. Sew his bow just a bit under his beak. For his hat, sew it on top of his head, but slightly to the side. For the eyes you can either choose to use felt or you can embroider them on. I chose to embroider them on, cause yeah why choose the easy way haha. But which way you choose, Donald will look adorable. I hope your Donald turned out lovely as well! ♥ A Red and a Gold Garland (about 270cm in length). 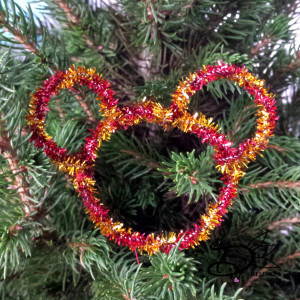 ♥ Hot glue gun and glue. ♥ Something to cut the wire with. 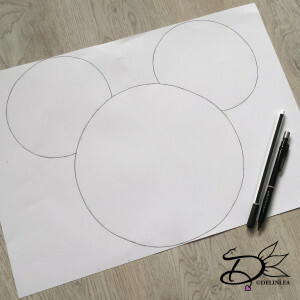 Start with drawing the shape you want, on to a piece of paper (I used 2 sheets of A4 and sticked them together). 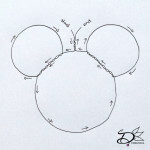 This template you will use to see if you bend the wire the right way. 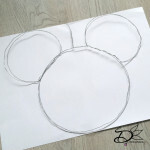 If you feel comfortable to bend the wire without template, go ahead! 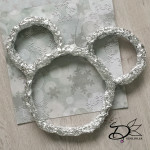 The big circle of my Mickey head is about 20cm in section, to give you an idea how big mine is. Ofcourse you can make yours bigger or smaller. Next you will start bending the wire, if you use a template place these underneath. Just follow the lines and twist the wire where needed (the 1st picture underneath is a small schedule where to start and where to end). To secure the wire where I twisted it, I added some tape, but you can totally skip that. 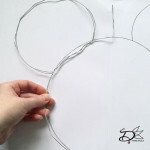 When you have the shape in wire you will start adding the aluminum foil around it, just add small strokes until you are happy with the thickness. I didn’t add to much, cause you need to keep in mind, that the garland will add to the thickness as well! Now it’s time for the fun part! 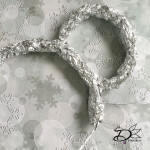 Wrapping the garlands around the base of wire and aluminum foil. Glue both of the garlands to the back of the base (at our starting point) and start wrapping it around. I did first a part of the big circle and then I did an ear and cutted it off and glued it to the base. Glued the Garlands to the base again and wrapped the rest of the big circle and did the other ear. When everything is covered with Garland you are pretty much done. The only thing left to do is, make a hook of the left over of the wire at the top of the head. Just bend it down in the middel so you have your hook, add yarn to it and hang it wherever you like in your home! And now, while writing this, I’m like how cute would it look with some light around the wreath as well..hmm..